Racing's Grand National meeting starts on Thursday with The New One seeking compensation for an unlucky defeat at last month's Cheltenham Festival. Sam Twiston-Davies will ride the horse, a fast-finishing third to Jezki in the Champion Hurdle, for his trainer father Nigel in the 15:05 BST Aintree Hurdle. First Lieutenant bids to win the Betfred Bowl (14:30) for the second year running, but faces high-class rivals in Dynaste and Silviniaco Conti. The action gets under way at 14:00. Mossey Joe, once considered a live outsider for Saturday's National, runs instead in the Fox Hunters' Chase over the big fences at Aintree. The New One's progress in the Champion Hurdle was stalled as Our Conor, who was later put down after suffering a serious injury, fell in his path. Twiston-Davies steadied his mount, allowed him time to recover, and he stayed on strongest to make the placings. "We lost ground and momentum, which we couldn't quite make back up, but he did an amazing job of finishing where he did," said the 21-year-old jockey, who rides Tidal Bay in the National on Saturday. "Hopefully, with a little bit of luck he can go very, very close at Aintree." One intriguing opponent on Thursday is the Harry Fry-trained Rock On Ruby, the 2012 Champion Hurdle winner and 2013 runner-up, who returns to the smaller obstacles after three runs over fences. First Lieutenant did not run at Cheltenham, after being withdrawn from the Gold Cup on the morning of the race, but trainer Mouse Morris hopes he is back to the same kind of form which saw him win at Aintree last year. Silviniaco Conti was third last year and comes to Aintree having finished fourth in the Gold Cup. The welfare of racehorses was very much in the spotlight at Cheltenham, where four racehorses died during the four-day meeting. Aintree's chief operations manager John Baker said he hoped safety changes introduced last year would help reduce the risk of serious injuries at the Merseyside track. Two horses died in each of the previous runnings of the Grand National, but all 40 runners in the famous steeplechase returned safely last year. "We looked at everything from the 2013 race but have decided that having produced a clean race where all 40 horses cleared Becher's Brook for the first time ever, we would say no more changes until we have a period of time where we can assess evidence that has been built up," said Baker. New flexible plastic fence cores, which are covered in spruce, have replaced the previous wooden centres, the National distance has been slightly shortened and jockeys urged to watch their speed in the early part of the race. Baker said the ground - which is described on the National course as Good to Soft, Good in places - is in excellent condition. Thursday's opener, at 14:00, is the first of four Grade One races on Thursday and features several beaten runners from the Triumph Hurdle at Cheltenham. Guitar Pete (third), Calipto (fourth) and Broughton (eighth) are all due to run in the Injured Jockeys' Fund 50th Anniversary Four-Year-Old Hurdle. 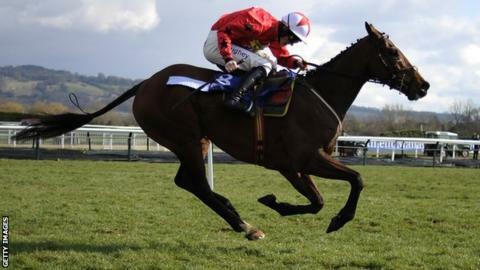 Activial, who missed Cheltenham, is a leading contender for trainer Fry. A top-class opening day card is further enhanced by another Grade One contest, the Manifesto Novices' Chase, which features Arkle Chase winner Western Warhorse and four others, including Oscar Whisky.